So here we are, Day 31 and various signs of progress to report. The outer garage wall and “verges” have been made good so we are truly weather-proof now. 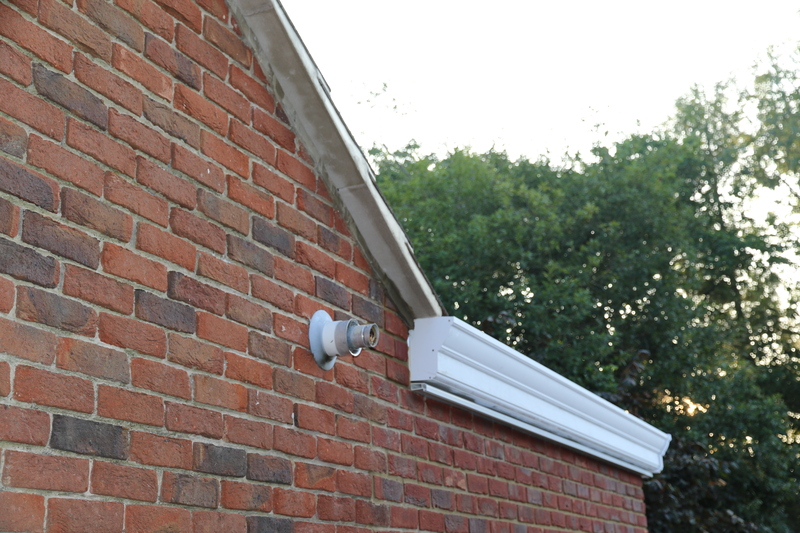 Conservatory – Garage wall and roof “verge” have been made good. The, original, grotty old bit of timber has been replaced by bricks and looks much, much better. The edge of the roof, “verge”, has also been made good. Verge was a term that until now I had only ever associated with the grassy edging along road sides. It appears it is also a term used to describe roof edging, presumably when there are no overhanging eaves, as is the case with our house. When taking these pictures I did note that the end cap is missing from the plastic sill. Unable to proceed with the tiling in the utility area Craig has made himself busy in other areas. The access point for the running gear of the “hidey / slidey” door now has a new removable cover. 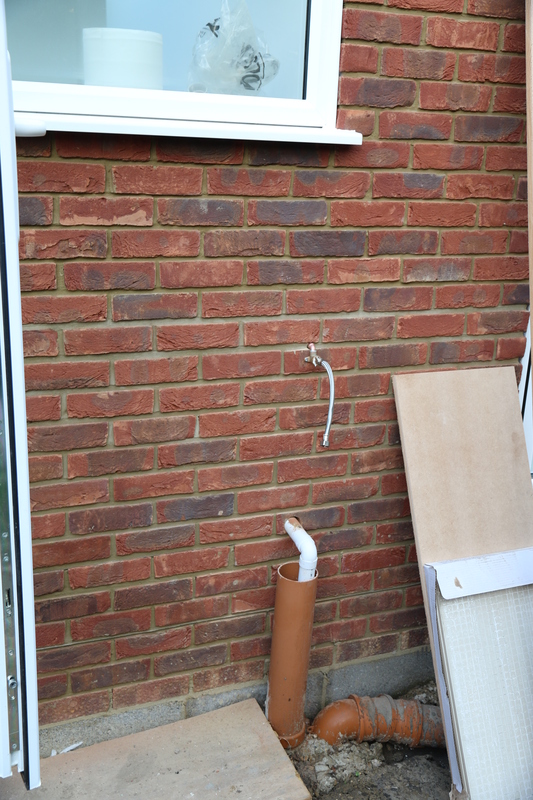 Conservatory – “hidey / slidey” door now has a cover for the running gear access. By the way, “hidey / slidey” is my term to describe the door and its ability to hide inside the wall. I was advised yesterday that the correct term is “Pocket Door” and although it does describe nature of the door I think I will stick with my descriptor. Also a new step has been constructed for inside the garage. 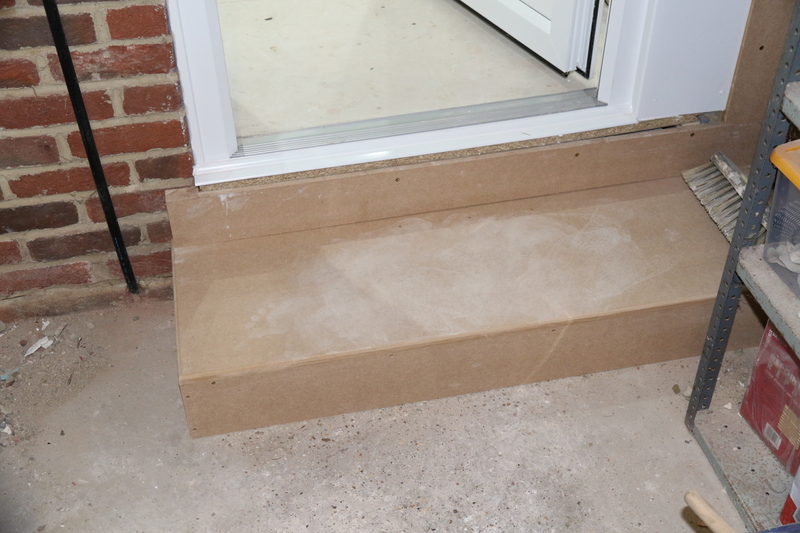 This step is needed since we have raised the floor in the conservatory to match the floor level in the house. 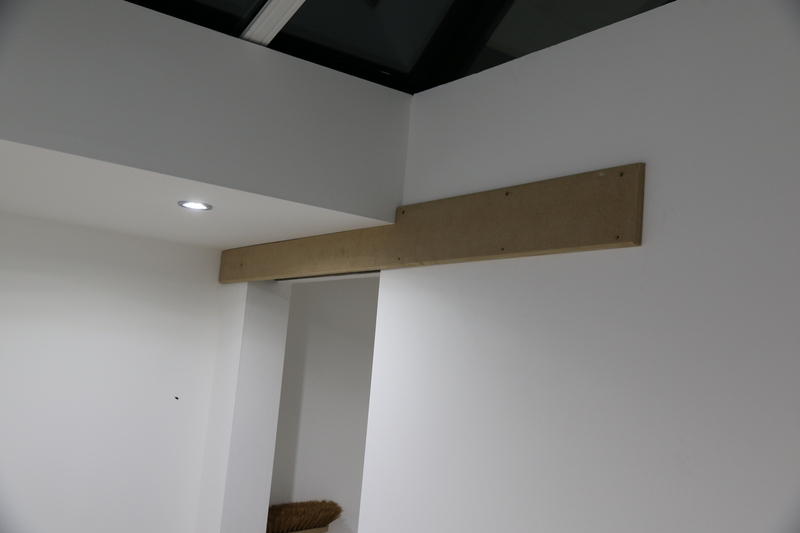 This in turn required the garage door to be lifted making the step down into the garage quite large. The step will make the transition much safer and of course easier on my ageing legs. Late in the day there was much rejoicing as a plumber appeared. Although not, it transpired, to do all the works on which we are waiting. However, this is a major achievement. 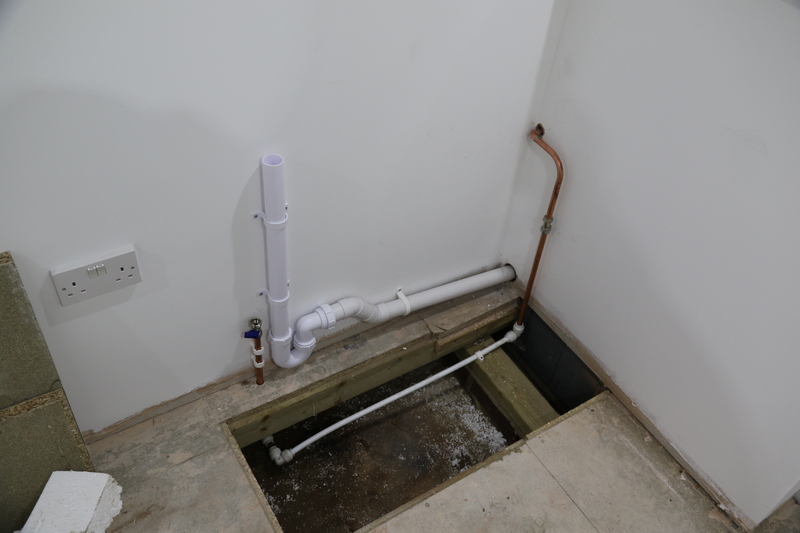 Conservatory – Plumbing for the washing machine. We now have a water supply and waste pipe for the washing machine. Unfortunately, nobody informed the plumber that the spec also called for an outside tap. Which meant that he had to modify his newly installed pipe-work. Still we have moved ahead and although the outside tap isn’t fitted there is access, outside, to water for cement and tile adhesive mixing. 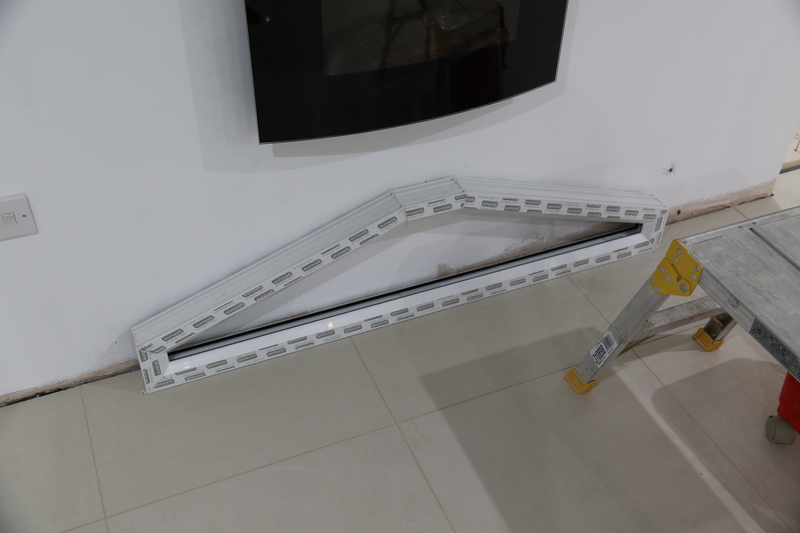 Also delivered today was the glazing frame to cap off the partition wall …..
Conservatory – Partition wall glazing frame. 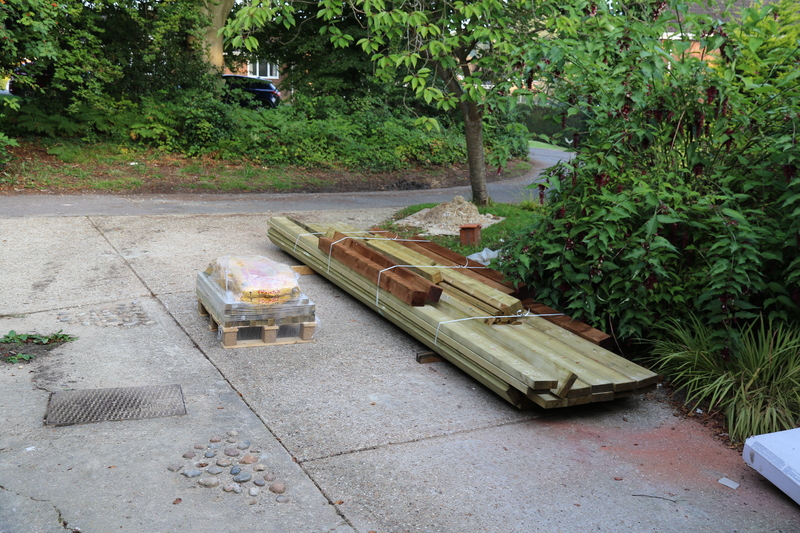 A truck also arrived to deliver the timber for the decking …. Looks a bit like a flat pack from Ikea although I don’t think it includes any instructions. This should be the last of the large material deliveries. Speaking to my neighbour, he has observed the expressions of the various delivery drivers as take note of the curve in the communal driveway and the overhanging trees. They have all managed to make it onto the drive and to escape afterwards so it can’t be that bad. With all of todays activities I think the light at the end of the tunnel is burning a little brighter. Lets just hope it’s not an express train heading this way. This entry was posted in Local (To Me !!!) and tagged conservatory, decking, Executive Windows, outside, plumber, pocket door, roof verge, step, tap, waste pipe. Bookmark the permalink. ← Conservatory Rebuild – Day 30 ?